Hi and welcome to my tutorial on Newton’s first law of motion. 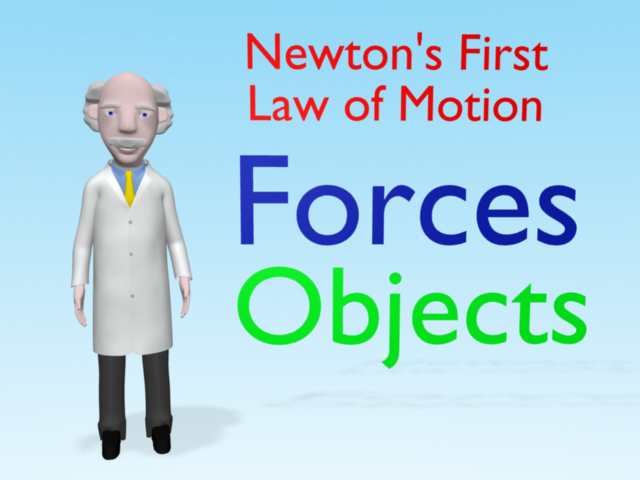 My video on Newton’s first law of motion explains how we may use the law to better understand the forces acting on an object by observing its motion. In this tutorial I will discuss the content of the video, which is a beautiful animation in Professor Mac’s unique style. The video demonstrates the law through an exciting experiment using a wooden block, an infinitely long polished table and a hydraulic piston! Below there are a number of images taken from the video to help illustrate the points being discussed. A direct link to the video is provided at the end of the tutorial. You can also revise for your exams and tests using my revision notes, which are available for download here. They may be read on Android, iOS, Kindle Fire devices and PC. The revision notes are in Kindle format, so for Android and iOS devices you will need to get the free Kindle application from Amazon. Once you have the app installed you are ready to download the revision notes and quickly prepare for your tests and exams. 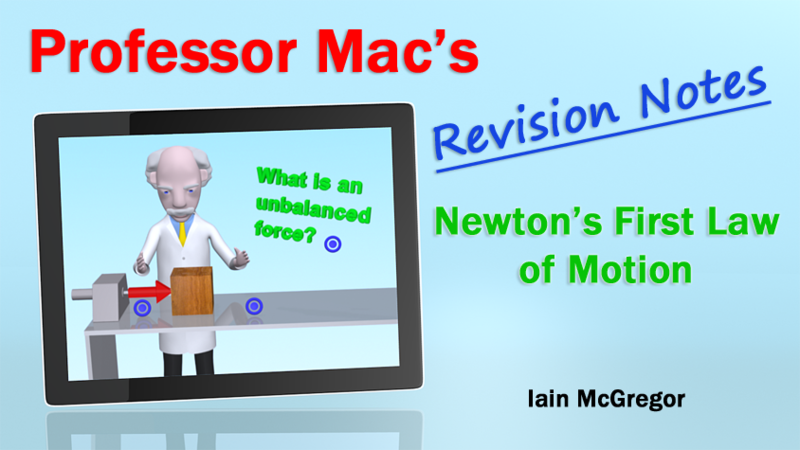 The revision notes for Newton’s First Law of Motion are available now. Newton’s first law of motion is one of three laws published by Sir Isaac Newton in 1687. The laws explain the interaction of forces and objects and the way in which the motion of an object is affected by force. a house where the idea is to have zero motion of the house. This, as we will see in a minute, requires all of the forces on the house to be in balance, otherwise the house would fall down (which is obviously undesirable). So what about the first law. 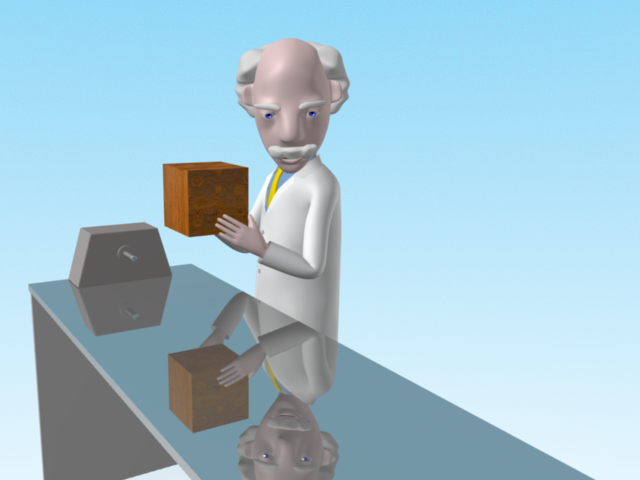 Well in the video I illustrate the law by conducting a series of experiments. I use a block of wood as the object and a surface which is so smooth that we can assume that it provides no resistance to the block moving on it. We refer to this type of surface as a frictionless surface, that is a surface with no friction. In the real world all surfaces have some friction. However in my virtual laboratory I can create ideal surfaces like the one shown below, which has no friction, so that we can conduct experiments under ideal conditions. What this means is that if an object is not moving then we can conclude that all the forces on the object are in balance. If they weren’t in balance then the object would accelerate under the action of the unbalanced forces. So let’s look at the forces on our block when it is resting stationary on the surface in my laboratory. Since the block is not moving, Newton’s first law tells us that the forces on the block must be in balance, otherwise it would start moving. The forces are represented by arrows. The longer the arrow the larger the force. The direction of the force is indicated by the direction of the arrow. In this case we see that there are forces only acting in the vertical direction. 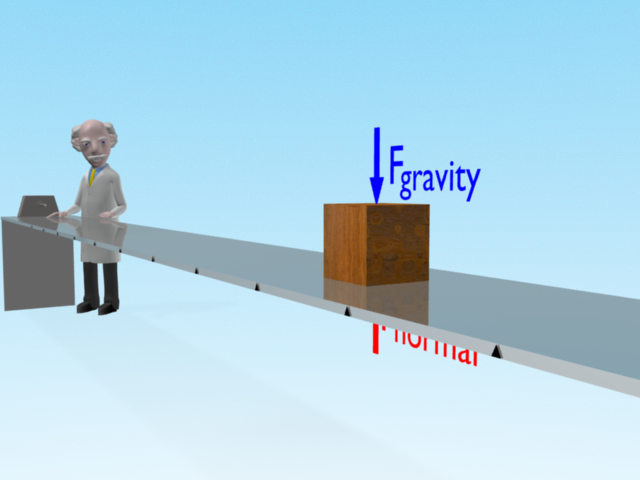 The first force is from gravity which acts vertically down. The other force is from the table on to the block. 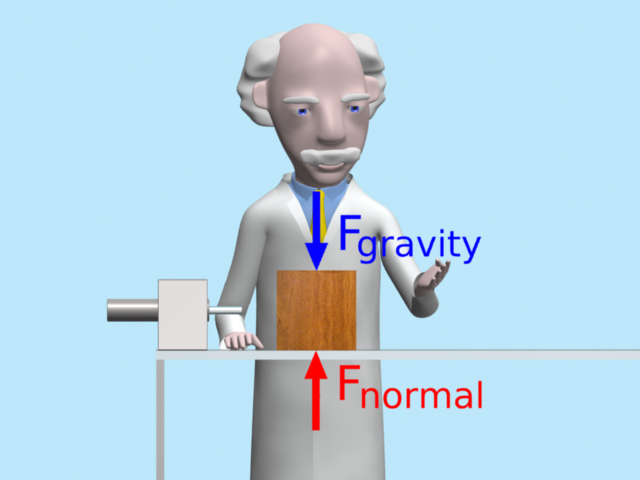 Now since the block is not moving in the vertical direction Newton’s first law tells us that the vertical force from the table on to the block must be upwards and equal in size to the gravity force. This means the forces in the vertical direction are in balance and the block continues to remain stationary in the vertical direction. In the horizontal direction there are no forces and so the block continues to remain stationary in the horizontal direction. So what if we introduce a horizontal force? What do you think will happen? Well in the video I do this by using the piston next to the block. The piston pushes the block to the right and the block changes from being stationary to moving horizontally. 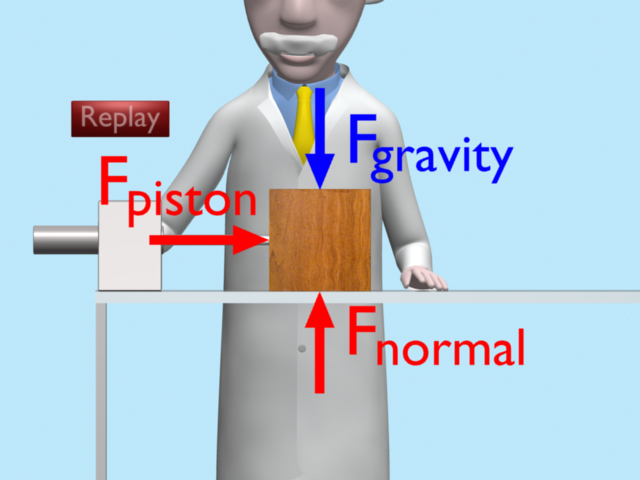 Newton’s first law tells us that this is because there is an unbalanced horizontal force acting on the block from the piston. The vertical forces are still in balance and therefore there is no change in the vertical motion of the block. It is only the horizontal motion which changes due to the action of the unbalanced horizontal force on the block from the piston. What this means is that if an object is moving in a straight line and continues to do so without increasing or reducing velocity, then the forces on the object are in balance. If they weren’t in balance then the object would accelerate or decelerate under the action of the unbalanced forces. I show this in the video with the block moving with constant motion (strictly speaking it is constant velocity) along the surface. There are no horizontal forces on the block as there is no piston force and the highly polished surface provides no resistance to the motion of the block. The vertical forces are still the same and therefore still in balance. So all forces are in balance resulting in no change in the motion of the block just as we would predict using Newton’s first law of motion. Note that it is still moving, but it doesn’t change with time. It is constant motion. You can use this knowledge to determine if the forces on an object are in balance by observing the motion of the object. If the object is stationary, and remains stationary, then you know that all of the forces on the object are in balance. If the object is moving with constant velocity and it does not accelerate or decelerate then all of the forces on the object are in balance. If the object is changing velocity (accelerating or decelerating) you know that there is an unbalanced force and the direction of the acceleration or deceleration shows the direction of the unbalanced force. Note that when there are no forces on an object then this is also a case where there is no unbalanced force acting on the object and the object will continue in its state of rest or uniform motion in a straight line. In other words no forces on an object means there is no unbalanced force on the object. A car: When you next observe a parked car you know that all of the forces on the car are in balance. When you see the car accelerating along the road you know that the engine is creating an unbalanced force on the car resulting in the car accelerating. And when you see a car moving along a road in a straight line with constant velocity you know that all the forces are in balance. The force generated from the engine balances the resistance forces from the road and the air. A ball: When you next observe a ball which is stationary on the ground you know all of the forces on the ball are in balance. And when your foot kicks the ball you know that your foot has introduced an unbalanced force on the ball which results in the ball accelerating in the direction of your kick. A house: When you next observe a house you know that all the forces on the house are in balance as it is not moving. The weight of the house and the forces generated by the wind are all balanced by the forces generated by the foundations of the house, resulting in the house remaining in its state of rest. Well, I hope you’ve enjoyed my tutorial on Newton’s first law of motion and please post any questions and comments you may have. Below is a link to the video and a link to the solution to the question I pose in the video. Once you start playing the video you can view it in high definition and full screen by selecting the options at the bottom right area of the video window. Next story What a big block! Thanks a lot Mac, this really helped some studies of mine. Me and some friends were studying this and needed some help understanding. You made it much more easier to understand now. Is it necessary to purchase the revision notes? I really appreciate your knowledge, however I don’t think I can purchase these notes! Hi Vivian, the notes are helpful to check if you understand the law. Why can’t you purchase them? this tutorial is very amazing . It really helps me with my report . Thank u soo much for this. Tomorrow i have to do seminar about this in my class i was wondering what to do and i found this. Thanks Mac you made my homework finally make sense! I now know Newtons firts law of motion! You are the best! I hope I get my homework right! Thanks for all these. Because I did not know how to study this it was difficult.Again thanks. Thank you mac…I am having a hard time understanding these laws and there you are making it really easy for me to grab.I wish my teacher discusses Physics the way you do…THANK YOU! Thanks for the feedback Meriam. I’m pleased you are finding the tutorials helpful. Good luck in your studies. I know how you feel Meriam! 🙂 And sorry everyone for the typo in my post at the bottom of the page. Oops! Thank you for the immense help! Had trouble understanding my college homework. You have made it abundantly clear!